6 + 7 = ? : (Required) Please type in the correct answer to the math question. Step 3: Connect the projector to the iPad using the cable in Step 1. Step 4: Discover that the iPad will show only photos and videos via the projector. (This has been fixed on the iPad 2 but is not retrofitable to the iPad 1. Step 5: Discover that the only way to show photos via the projector is to select SlideShow which will have no pause feature so you can control the presentation. Step 8: Insert 194 jpg slides into a PowerPoint presentation on the laptop resizing each photo so it will fit the PowerPoint window. Step 9: Connect the iPad to the laptop computer with the Apple USB cable and open iTunes. Step 10: Select iTunes menu item APPs and scroll down till you see a window called FileSharing. Select Keynote. Click Add in the lower right corner. Find the PowerPoint presentation and click Open. The file will now appear under Keynote Documents. Step 11: Open Keynote on the iPad. Touch the + sign in the upper left corner. Touch copy from iTunes and the file to be transferred. Keynote running in the iPad now converts the PowerPoint complete with most effects and transitions. That is impressive. Step 12: Touch the PowerPoint Icon and start the presentation. Note that the projector screen is black and the projector is looking for a computer. You have to touch the Play symbol to show your presentation. Step 13: Start the Keynote App in the iPod Touch. Touch the tool symbol in the iPad and touch the name of the iPad. A 4 digit code appears. Key in the 4 digit code and the iPod and iPad will connect and you can control the presentation from your iPod Touch (or iPhone). 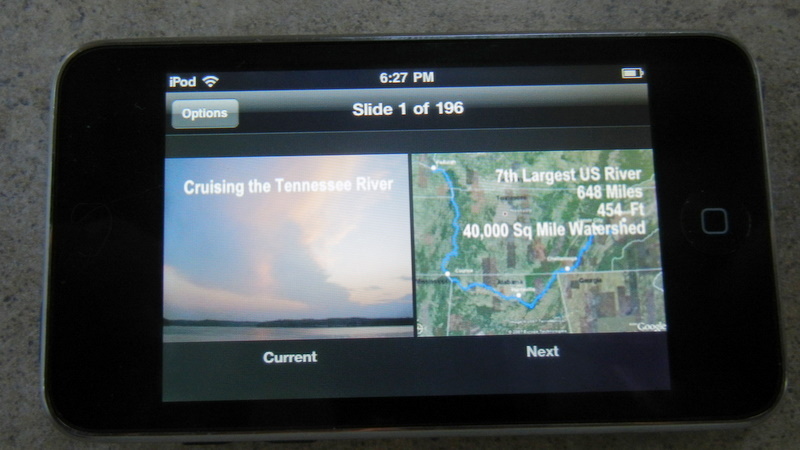 The screen on the iPod will show the slide on the screen and the next slide that is being queued up. That's a neat feature. The only thing missing is a laser pointer which Apple has not built into the iPod or iPhone. However, I still have my laptop remote control that does have a pointer and I'll use it. 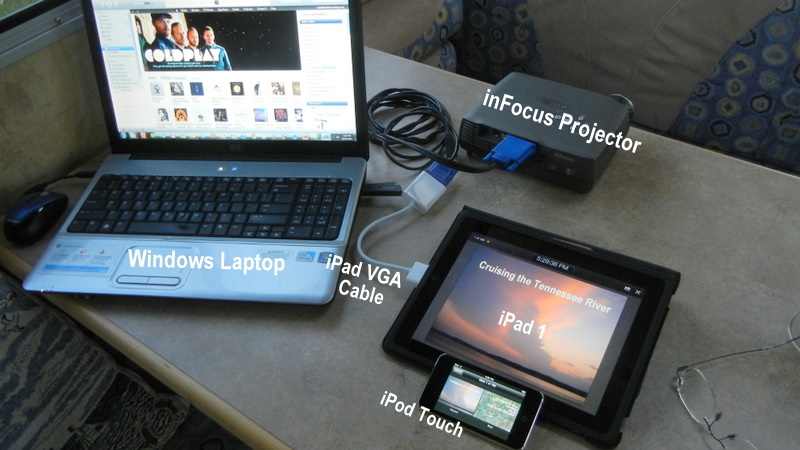 I wonder if anyone will notice how cool I look using an iPad to give my presentation on Wednesday. My bigger worry is some smart guy will say, you dummy,there is a simpler way to do it than the 13 step procedure. Of course, so I'll have backup if something goes wrong, I'll still have to carry my laptop to the meeting.